Zillow has launched a new touching commercial, aimed at highlighting that “The right home has room for new memories and old ones, too” while encouraging viewers to find their way home with Zillow. Titled “Time Capsule”, the 60-second spot features a man (played by actor Ben Bode) watching a house listed on Zillow for a long time before finally finding it for sale on the wesbite. In the meantime, he’s spending his time playing baseball with his young son and helping his wife in the kitchen. One day, he gets a notification on his smartphone, as he uses the Zillow app, too, informing that the property he had saved is now for sale. Supported by his wife, he immediately contacts the agent and they move in. While unpacking, he takes a spade and goes under a tree near the house to dig up the metal box he had buried there as a child. His son joins him and, looking at a picture showing his dad as a kid and his grandfather standing in front of the house, realizes their new house is actually the house his dad grew up in. The commercial, created by agency Deutsch, directed by Prettybird’s Matt Smukler and soundtracked by “Hey Old Friend” by K.S. Rhoads, ends with the voiceover saying “Find your way home”. 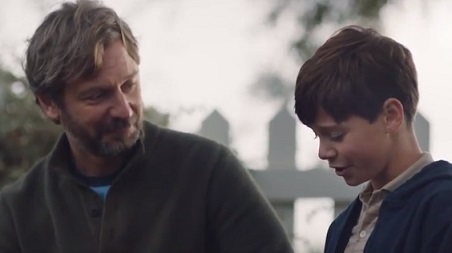 This is not the first time Zillow tugs at people’s heartstrings with its commercials. In May 2017, the “Stars” ad, also from Deutsch and directed by filmmaker Natalie Rae, featured a single father who bought a new home closer to his son’s grandparents. The kid, watching the stars through the skylight window of his new room, says “Good night, mom!”.